A random piece of craftery for you today. A painting...sort of. I went over to my dear friend Lois' place recently, where she pulled out masses of paint supplies and declared it craft time. Always a fun surprise. My husband loves pancakes. I mean loooooves them. I often joke that he pre-courted me with pancakes as he frequently managed to make a fresh batch with too many right when he knew I would be nearby. 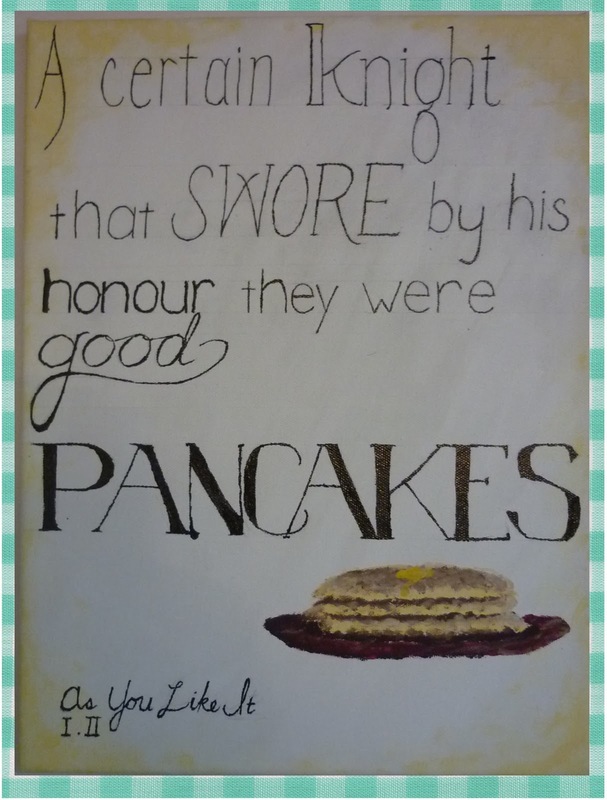 He treasures a heavily earmarked copy of The Pancakes Cookbook by Myra Waldo, and at the front of it I found the above quote. I just couldn't resist turning that into something for our walls. 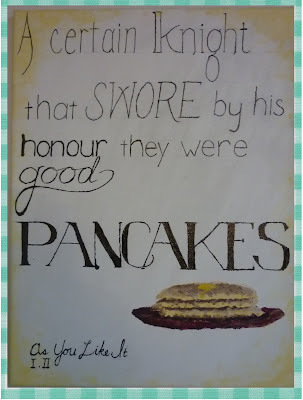 Come on: Shakespeare + pancakes in a house of flapjack addicted thespians? It was necessary. So now I finally have something to hang on the formerly naked wall above our stove. So go make some pancakes! Here is a classic buttermilk recipe to get you going if you need it. Sift together the flour, salt, baking powder, baking soda, nutmeg and sugar. Beat the eggs, then mix in the buttermilk. Add to the flour mixture, stirring only until smooth. Mix in the melted butter or vegetable oil. Rub a griddle or heavy skillet with vegetable oil or butter. Heat until a drop of water jumps when dropped on it. Pour the batter onto it by the ladle or tablespoon, depending on the size pancake you want. Bake until browned on both sides. Serve with any pancake accompaniment. Makes about 24 5" or 48 2.5" pancakes. "Blend evenly with a big spoon, but don't over stir - there should still be plenty of air bubbles throughout...And only flip once." Have a happy Pancake Day.